Here are some of the systems we used at our races. Although paper-based, they allowed hundreds of runners to be processed on the day of the race. We use the standard FRA race entry forms downloaded from the FRA Race Organisers page, and modify them in MS Word (we use LibreOffice) for each race with minimum age, age class boxes etc. before printing. We generally make these available as PDF files for download and print on the race information page on our website, for the convenience of runners who like to complete them in advance and bring them along. BUT we still print enough forms for everyone on the day. And we print the junior registration forms on coloured paper to differentiate them. The race number must be entered in the "Race Number" box on the form at the time it is issued at Registration as part of the safety procedures. We get our race numbers from Pymmwenn Printing - they're quick, they print all sorts of things on them for us (sponsor's logos, photos of the Brownlees, etc.) to make them real collectors items, and they're reasonably priced. We like the "Budget Sized" numbers, plenty of room to print stuff at the top but not too big for the runners. 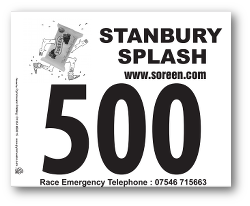 We now print an emergency race contact number (cheap dedicated mobile phone) on the bottom. Once a runner is issued with a race number on race day, they must report to us if they decide not to start (DNS), or start but do not finish (DNF), for safety reasons. Pymmwenn is a good place to buy safety pins too! We always supply safety pins (allow 4 for every runner) and don't collect them in as that's a safety hazard. Remove the sticky trim and draw lines ('on the cracks') between each row of labels, to help on race day. These should be completed with the registration form in hand and the runner in front of you as part of the safety procedures (dual logging of name against race number). Writing the labels needs a neat hand: class in top right corner, name on next line, club on bottom line). Use a blue or black pen (not red). 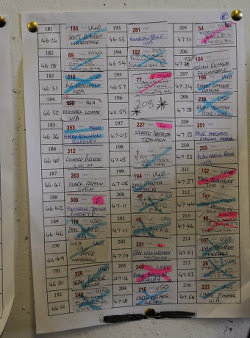 In the lull between Registration and the first runners finishing, we mark the labels up with highlighter pen to make class winners easy to detect on the provisional results. A finish official at the finish tunnel records the race number directly onto the A4 sheets that will be used for results. Write the number in the 'big box' where the label will be stuck over it later. Large and legible with a dark pen or pencil. An asssistant is needed to call out the numbers for the person writing down. We use sheets with 36 results to an A4 page: here's a Template Excel file (just change cell A1 to '37' for the 2nd sheet, etc.). Fold a dog-ear on the bottom corner of each sheet to help stop them sticking together. Use a Weatherwriter waterproof clipboard. We use a Seiko printing stopwatch (still available to purchase on eBay) for time recording. As soon as a sheet is completed, it is taken from the finish official to the results team. They stick the corresponding label on for each finisher and transcribe the finish times. Neatness and speed are important. This allows provisional results to be displayed very quickly. Class winners and team results are worked out as the results are displayed. DNS and DNF runners have their labels marked. Then towards the end of the race the unmarked labels left on teh sheets give a clear indication of who is still on the course.